Antonio Cicconetti first appears in the Painesville, Ohio, area in 1923. In America, Antonio Cicconetti was known as Tony Cicconetti. Antonio Cicconetti was born on September 23, 1900, at Campli, Italy. He married Grace Vitrano on September 18, 1926. Antonio died on February 15, 1968, at Homestead Nursing Home, Painesville, Lake County, Ohio, at age 67. His body was interred at Riverside Cemetery at Painesville, Lake County, Ohio. Antonio Cicconetti immigrated to the United States on July 8, 1923, at age 22. He was travelling to Painesville, Lake County, Ohio, to join his cousin, Mattia Valocchi. Antonio Cicconetti became a citizen of the United States on September 21, 1936. Antonio resided at 491 Payne Avenue, Painesville, Lake County, Ohio, when he was naturalized. 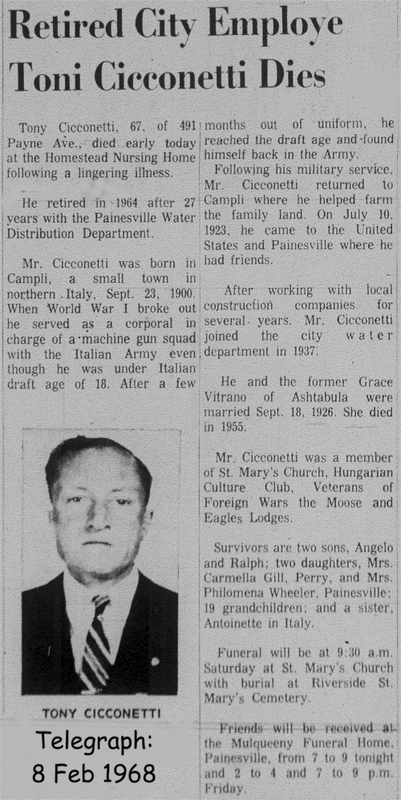 Mr. Cicconetti was employed by the Painesville City Water Department beginning in 1937. Antonio Cicconetti may have been related to Painesville Italian Zaccaria Cicconetti. 1. Angelo Cicconetti was born on August 22, 1927, at Painesville, Lake County, Ohio. He married Jacqueline Coyne about 1960 at Painesville, Ohio. Angelo died on June 11, 2011, at TriPoint Hospital, Concord Township, Lake County, Ohio, at age 83. 2. Ralph D. Cicconetti was born on November 27, 1928, at Painesville, Ohio. He first married Angele Marie Bertoni. He married second, Phyllis Tuikka. Ralph died on June 30, 2001, at Altercare Nursing Home, Painesville, Lake County, Ohio, at age 72. His body was interred at Riverside Cemetery at Painesville, Lake County, Ohio. 3. Philomena Cicconetti was born on October 24, 1930. She married Norris Wheeler. 4. Carmella Cicconetti was born on December 3, 1934. She married Earl E. Gill, son of John J. Gill and Alice Jenkins. Carmella died on March 14, 2001, at age 66. Her body was interred at Perry Center Cemetery at Perry, Lake County, Ohio.